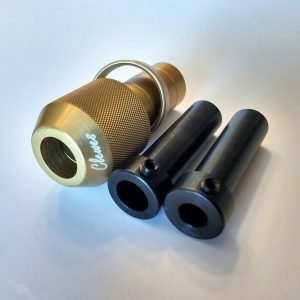 I have made several woodturning tool handles for my tools over the years, most of which use the Jimmy Clewes Quick Release adapters. 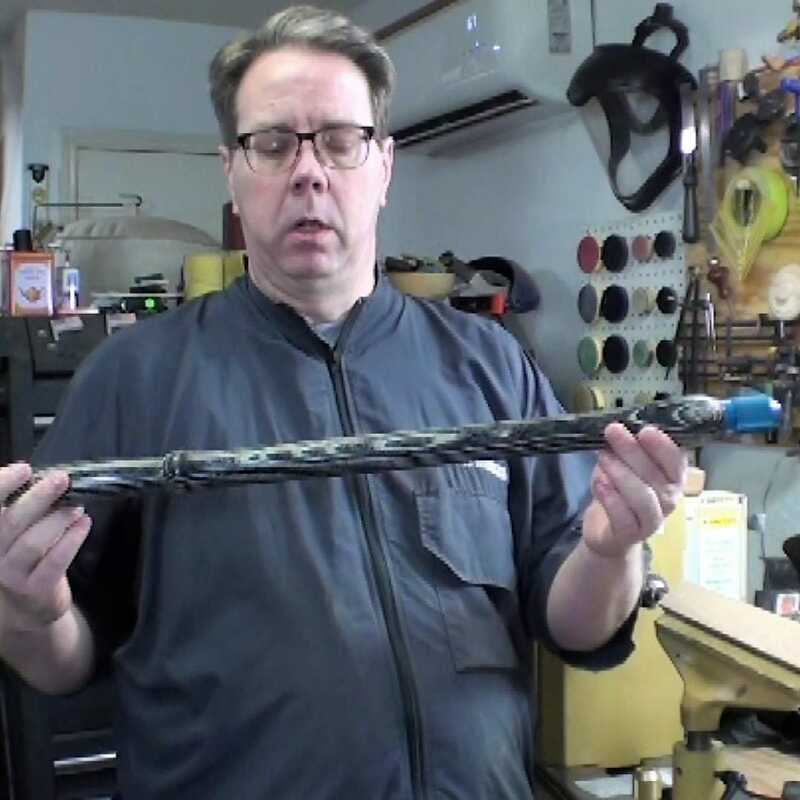 I needed a long woodturning tool handle to use with the new TOD RAINES TOOLS tool bars – the Hook Tool Bar and the Half Round Tool Bar. 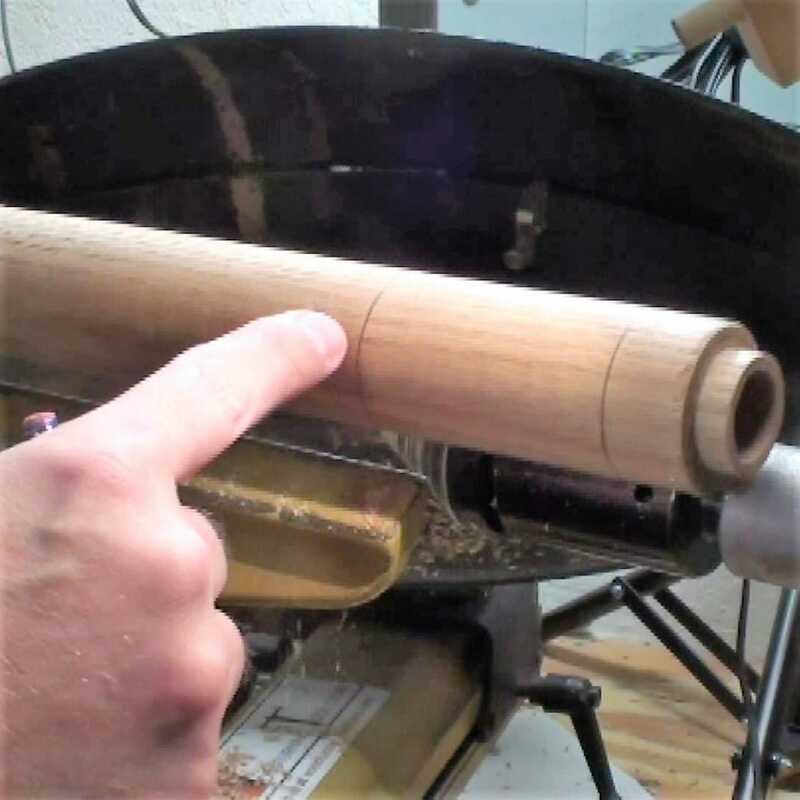 The photo to the above shows a long woodturning tool handle with the Jimmy Clewes 1/2″ Quick Release Adapter. 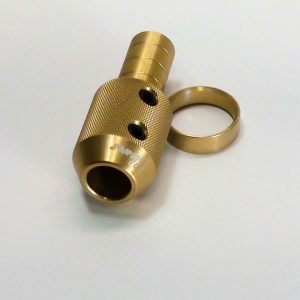 The new woodturning tool handle will be equipped with the Jimmy Clewes 5/8″ Quick Release Adapter. 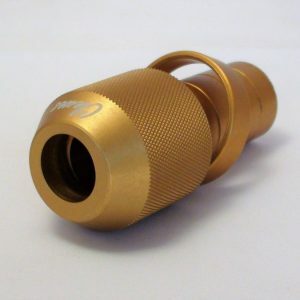 I will probably make another using the Jimmy Clewes 5/8″Set Screw Adapter. 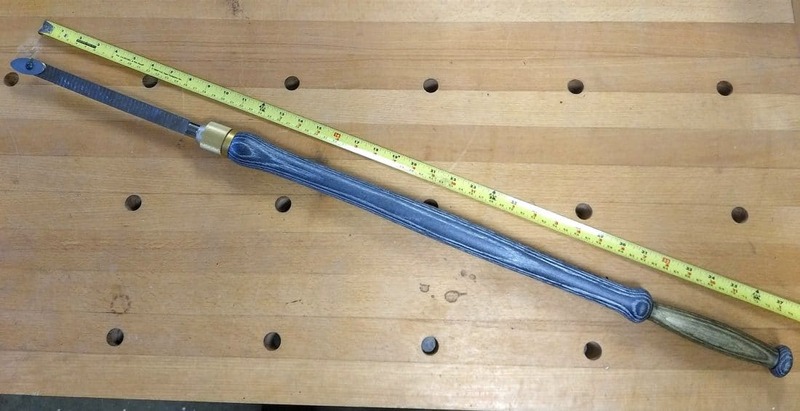 I used a 26″ stick of red oak that was just under 2″ inches in diameter. This is what I had in the shop that was an open grained wood. 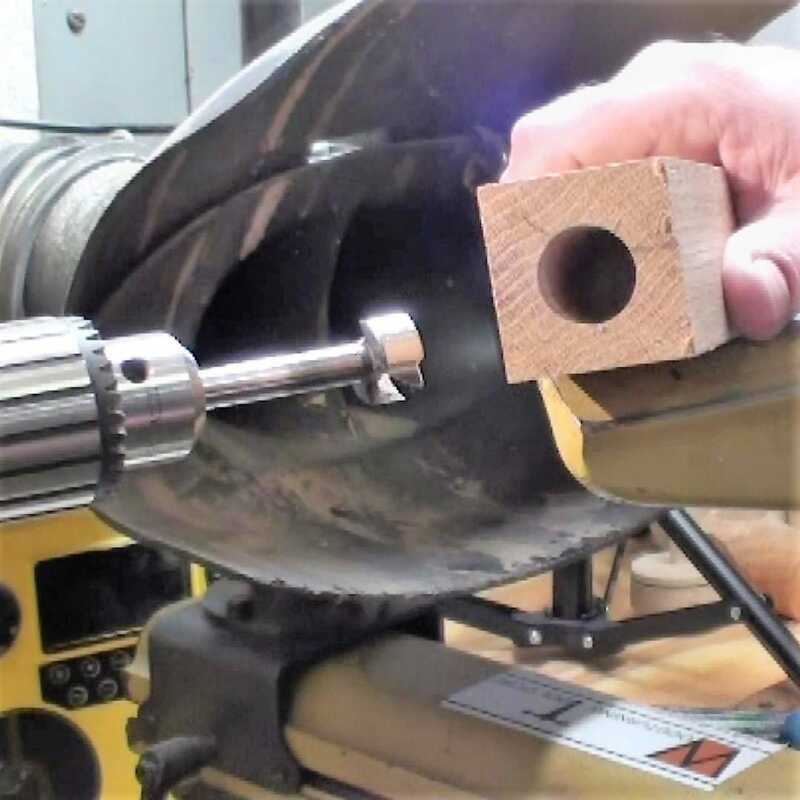 With this method I drill the hole for the woodturning tool handle adapter first, using the drill bit in a Jacobs chuck in the headstock. The only way I recommend doing this is with the security of a drawbar. 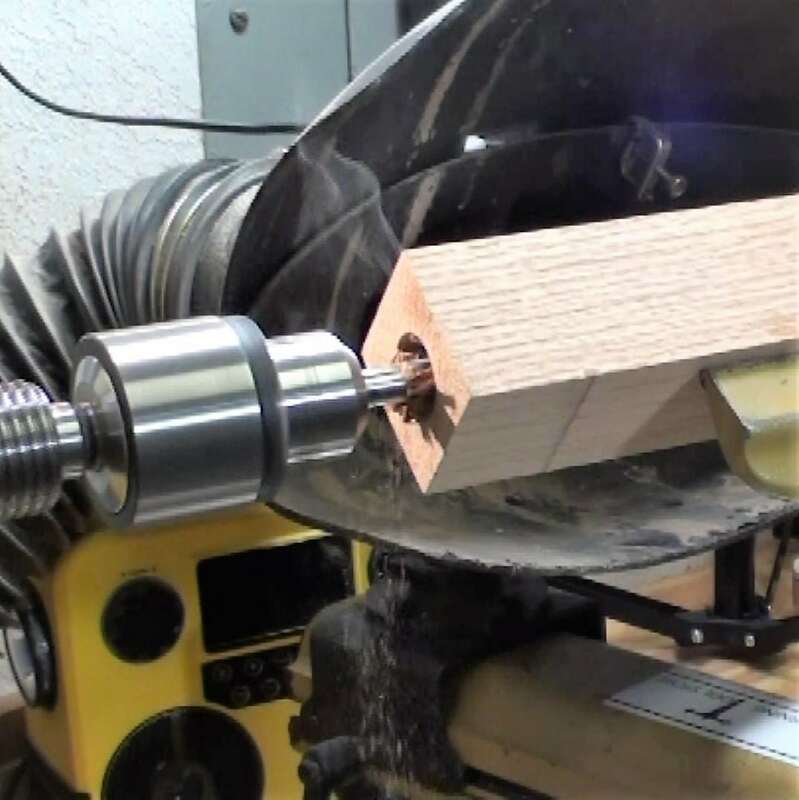 My Jacobs chuck has 1/4″-20 tpi threading in the end of the Morse taper so I use my drawbar through the headstock to secure the chuck to prevent it from being pulled out of the spindle as I retract the wood from the drill bit. 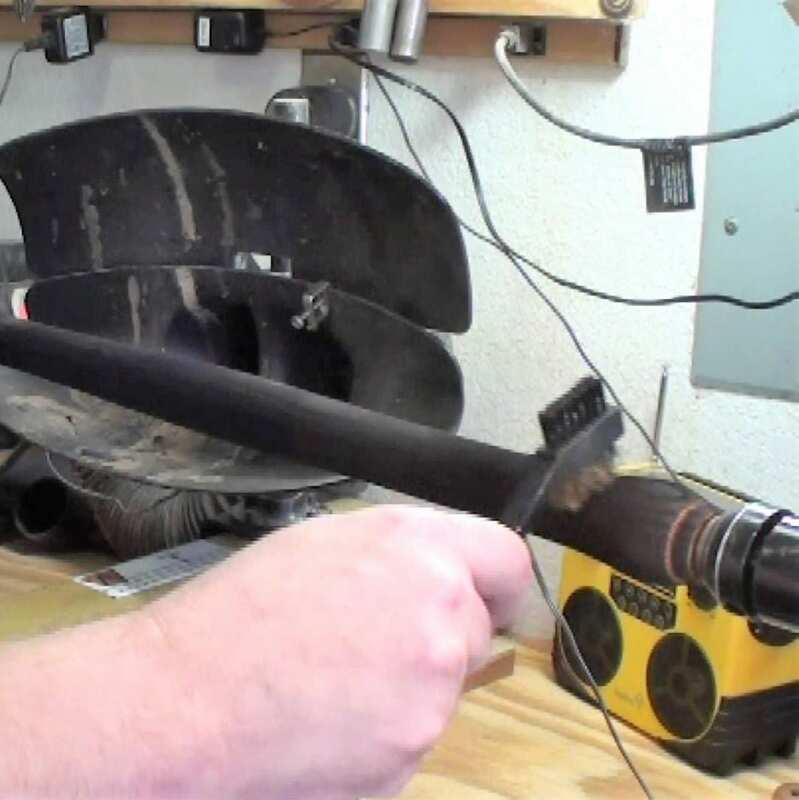 I am going to install a Jimmy Clewes 5/8″Quick Release Handle Adapter, so here I am measuring the depth to drill. A mark on the drill bit indicates the depth. 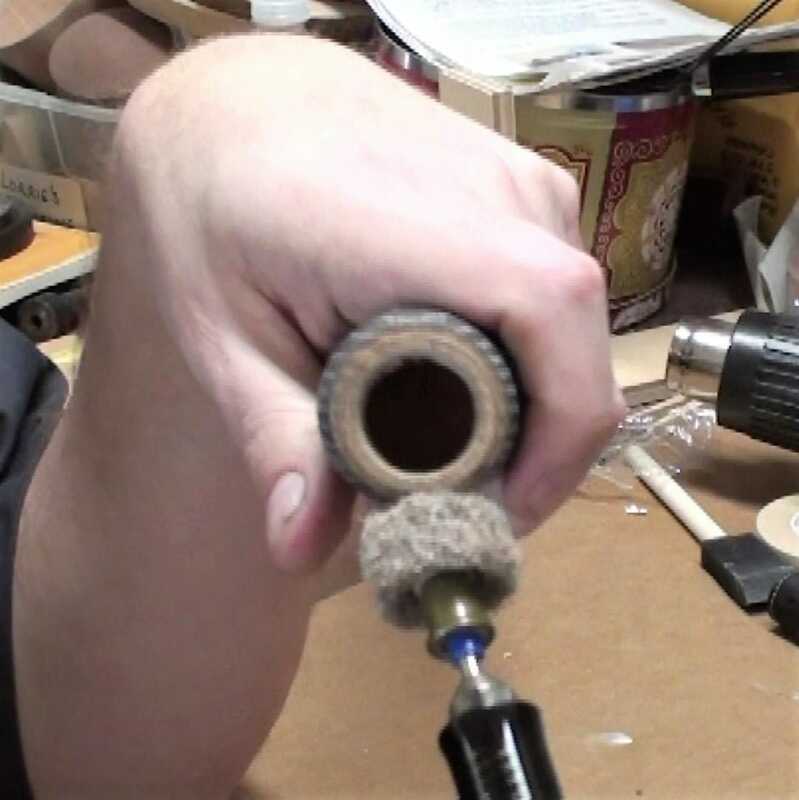 Use a drill bit sized for the diameter of the Quick Release Handle adapter. 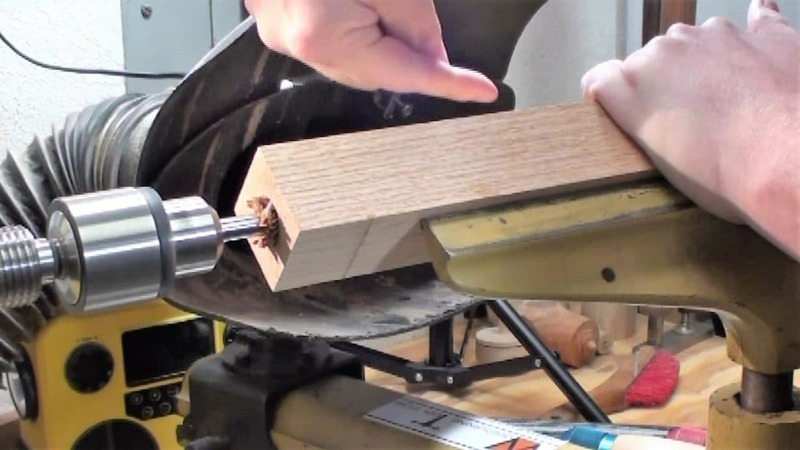 The tool rest is set parallel and close to the square blank to prevent the wood from spinning as I drill. I first saw this method done by Cindy Drozda. I am sure others have used this method before. 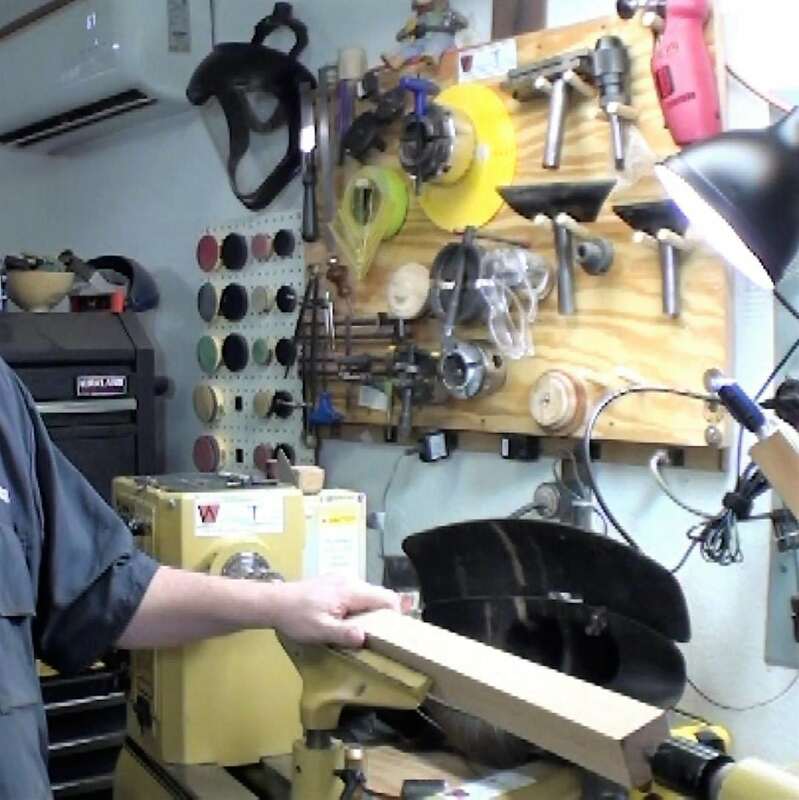 Here I am indicating to pull the blank towards the tailstock as you retract the wood from the bit. 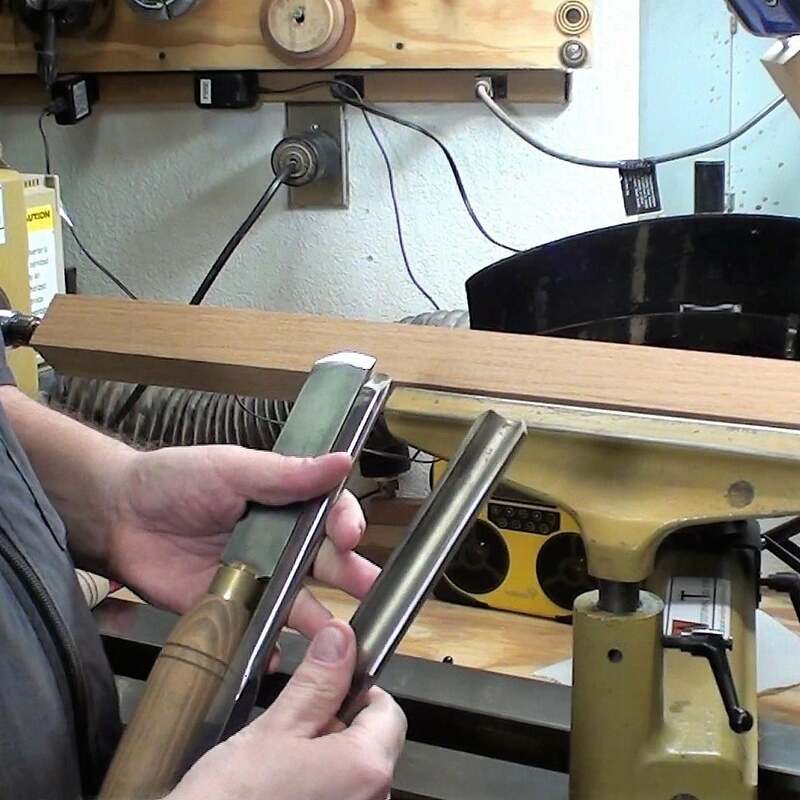 Hold the piece with your left hand and pull it towards the tailstock as you use your right hand to spin the tailstock handle. 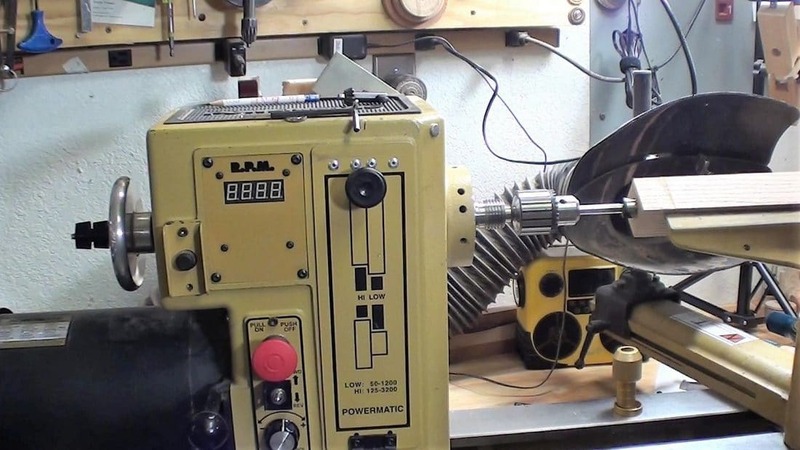 Just finishing the drilling, which is turning about 500-700 rpm. A little smoke is okay but beware of smoldering embers that may fall out. 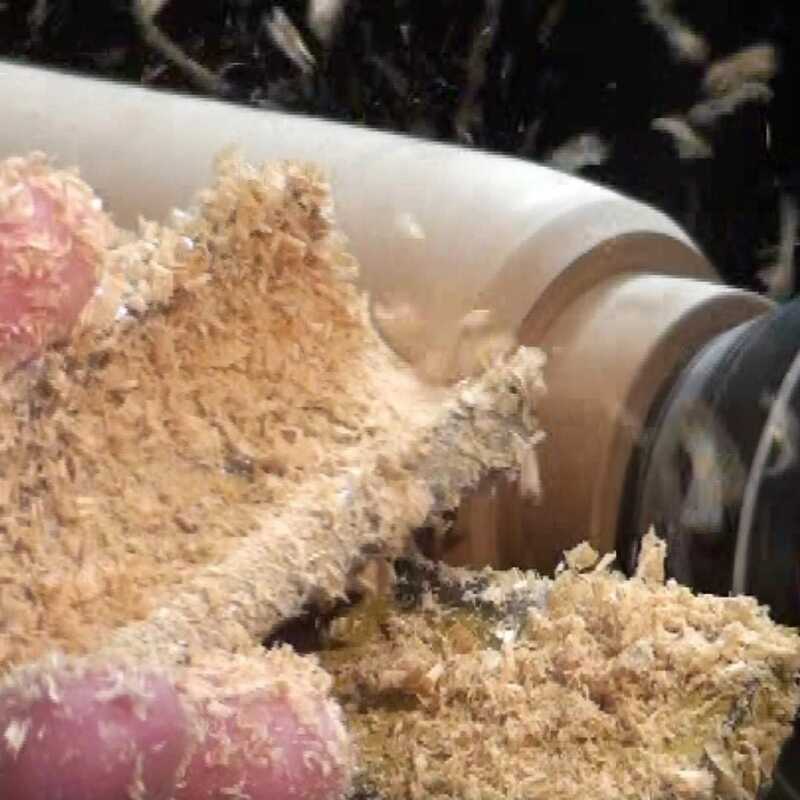 Please keep your floors clear when drilling on the lathe. 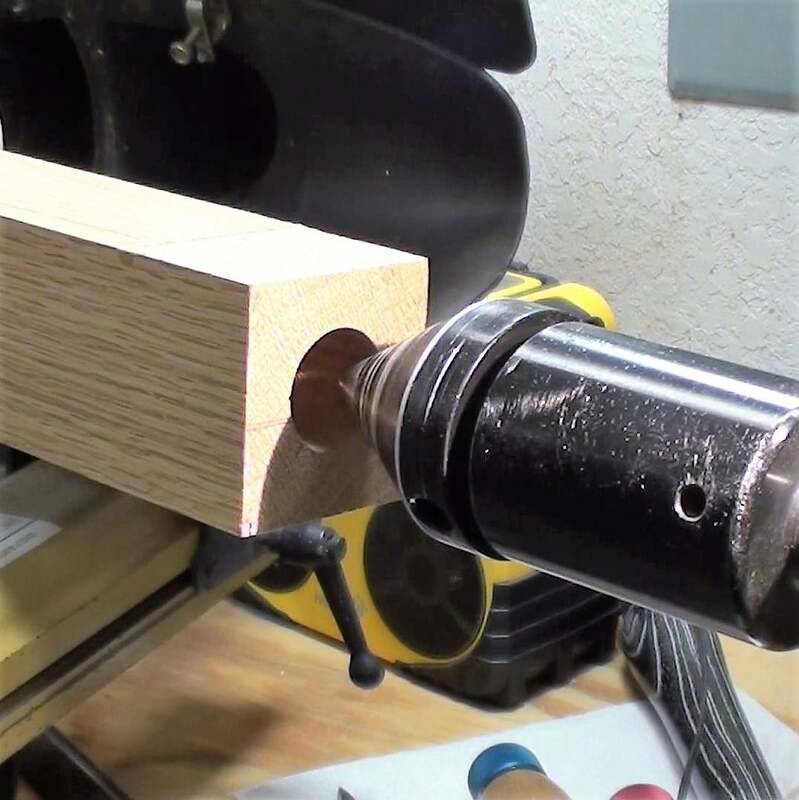 The woodturning tool handle blank now has a hole drilled to final depth. 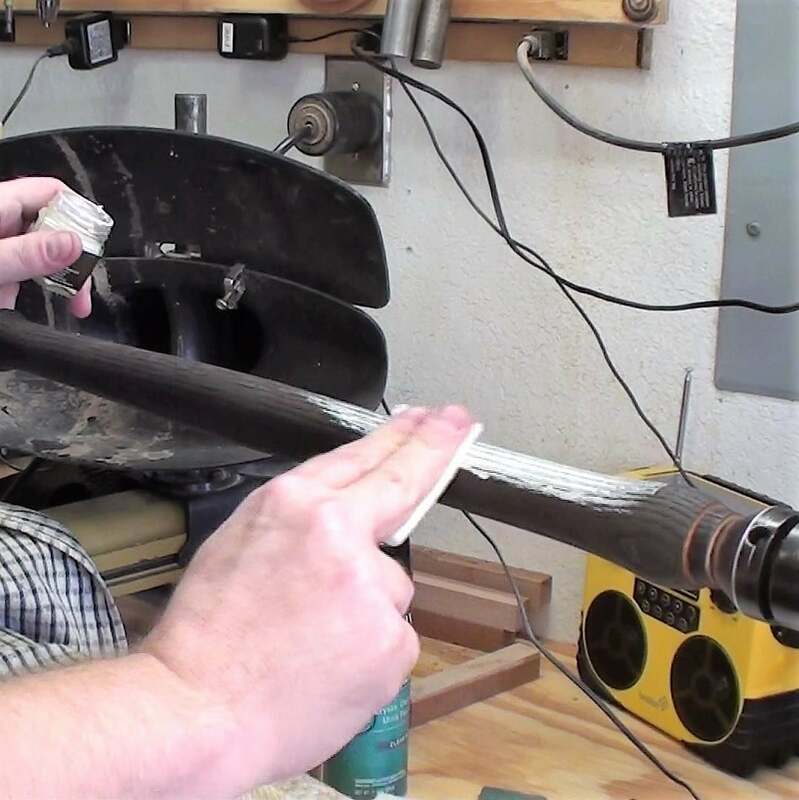 It will need a little sanding to ease the fit of the Jimmy Clewes 5/8″ Quick Release adapter. 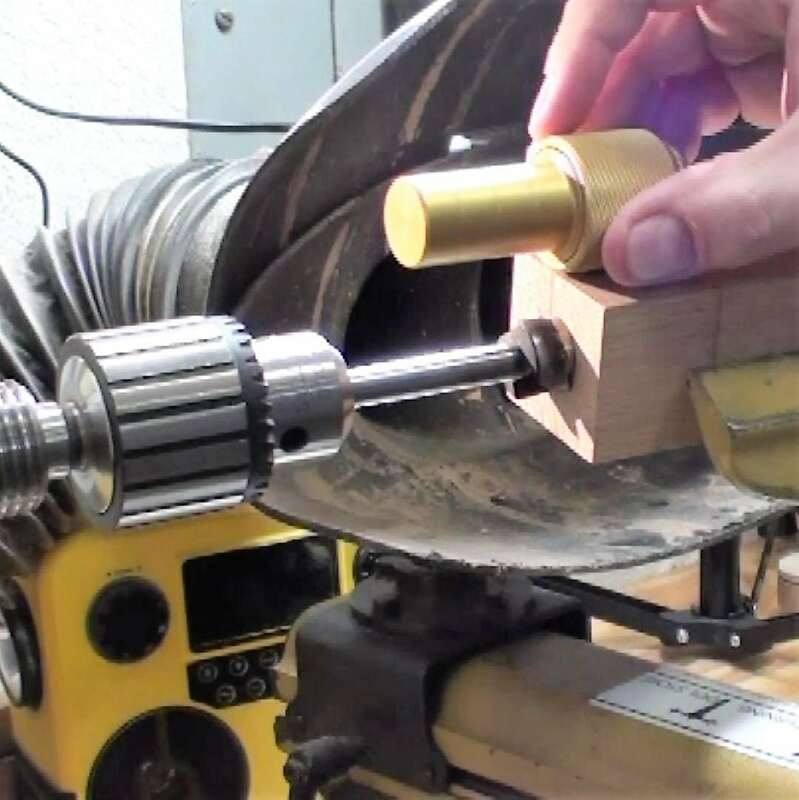 For turning the woodturning tool handle, I remove the Jacobs chuck and replace it with a cup center in the headstock. I center the blank using the reference center mark that was made in the blank by the tailstock. 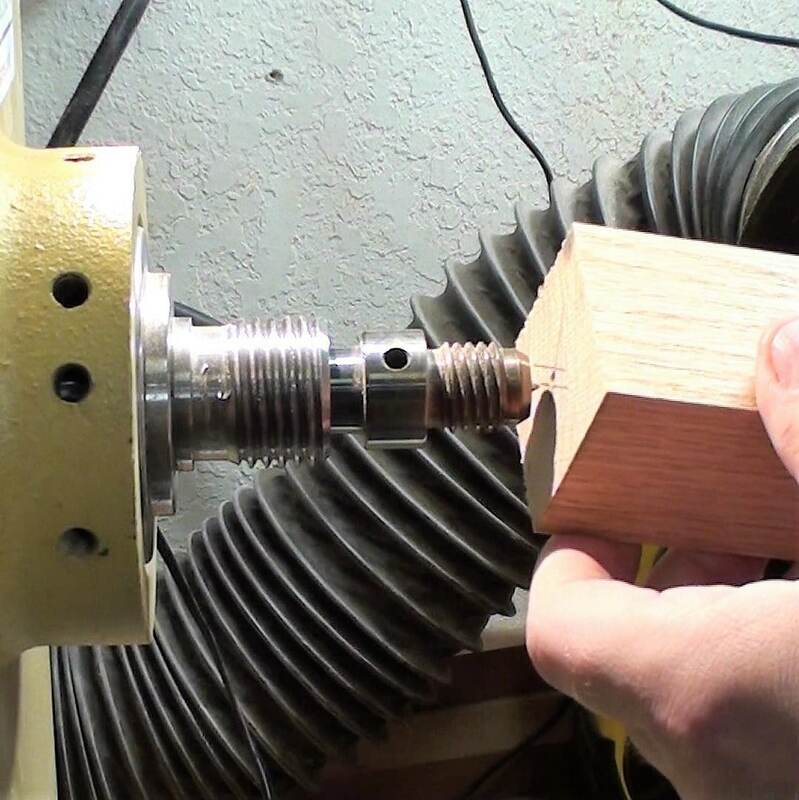 I use the cone on my tailstock live center which self centers in the hole. 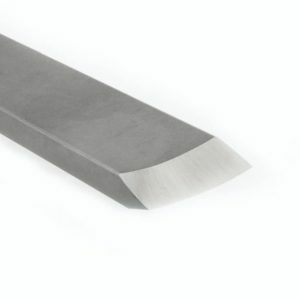 The turning tools I used include a roughing gouge and large and smaller skews. 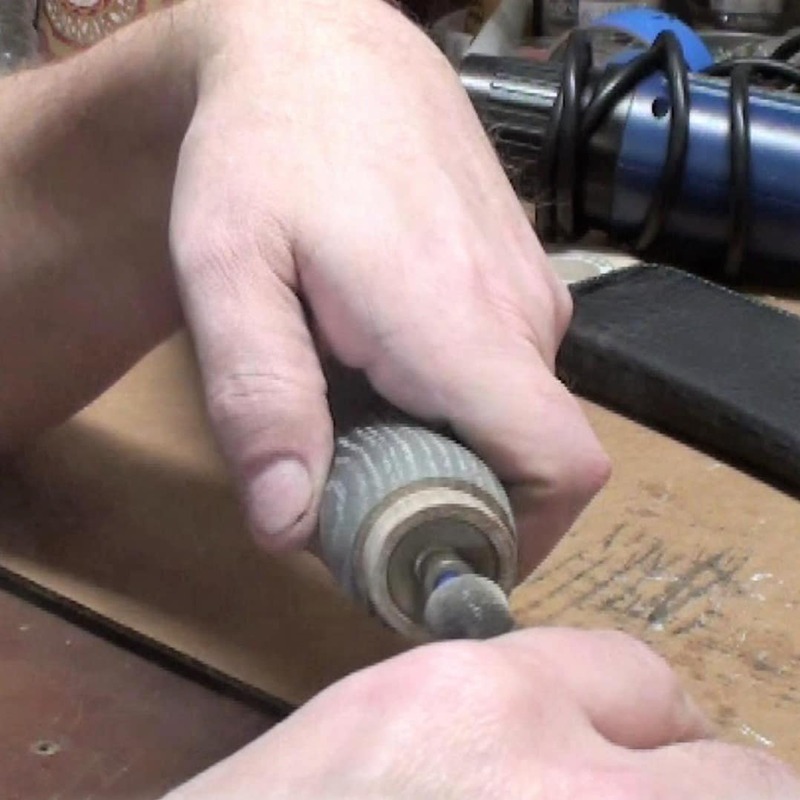 I also ended up using a 1/2″ spindle gouge to cut some beads and coves on the tool handle. This is a great time for some skew practice.This red oak is tough and splinters quite a bit but it turns smooth once it is round. 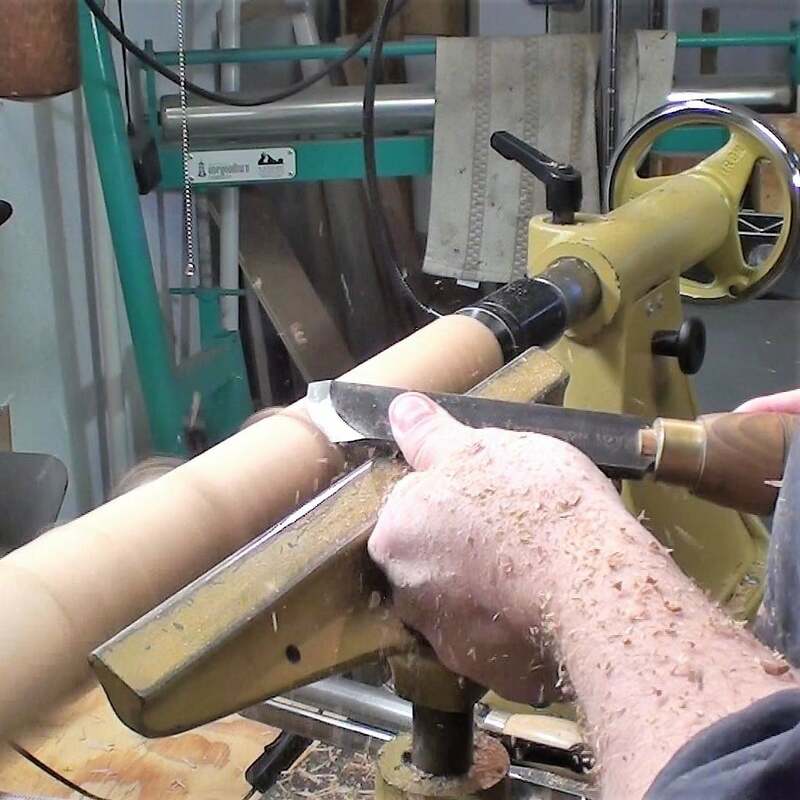 Here I am referencing the ferrule collar from the Quick Release Adapter kit that is mounted on a short tenon on the business end of the woodturning tool handle. 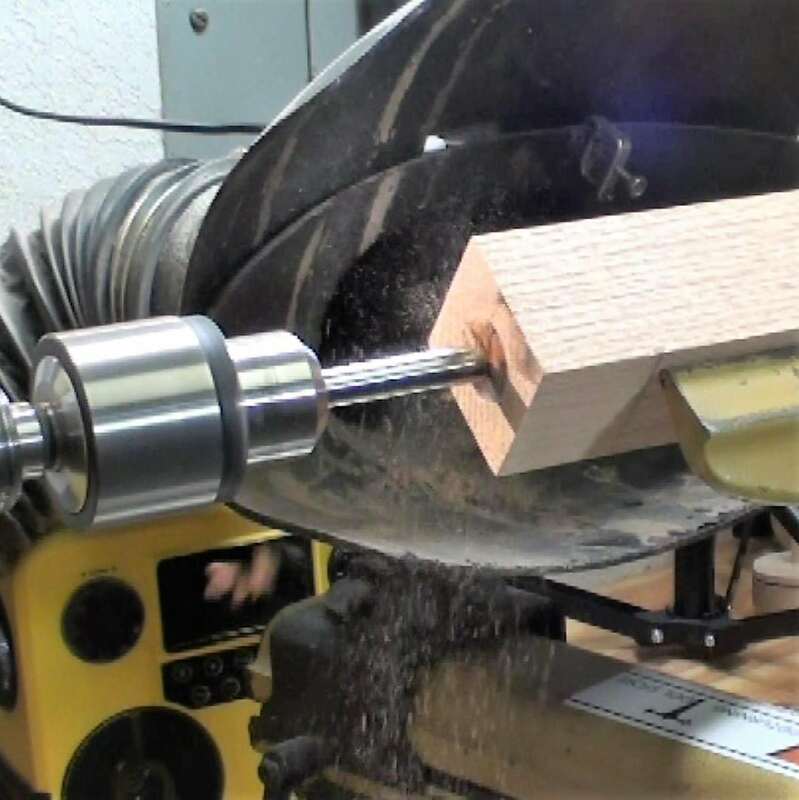 I set my calipers to the inside diameter of the ferrule and then I proceed to cut that small tenon using a parting tool and the calipers to gauge my progress. 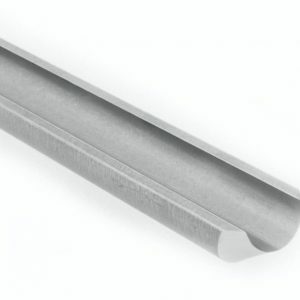 Make this tenon the width of the ferrule so that you don’t have any excess tenon protruding beyond the width of the ferrule as this would interfere with the Quick Release adapter. With the ferrule in place, I mark the outer circumference of the ferrule on the end of the handle. 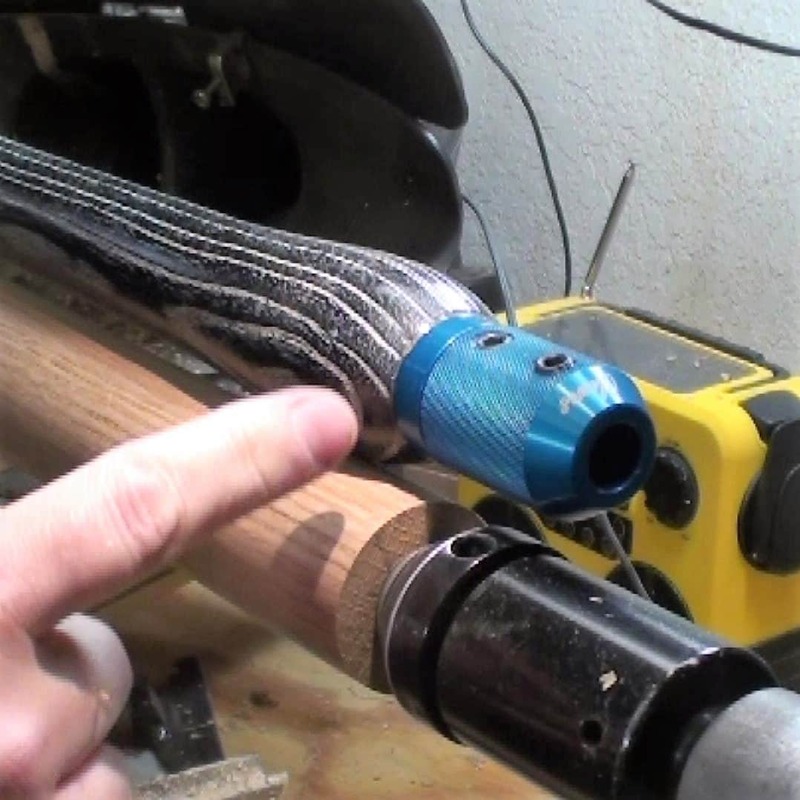 This will be used to guide how deep the beaded end will need to be. 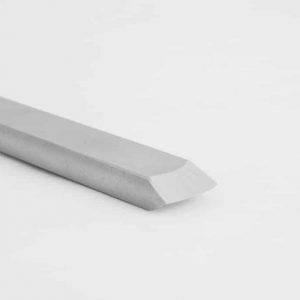 This mark is indicating the point on the woodturning tool handle with the minimum diameter. The line just to the right indicates the maximum diameter. I have other reference lines further down the handle to indicate other transition areas. 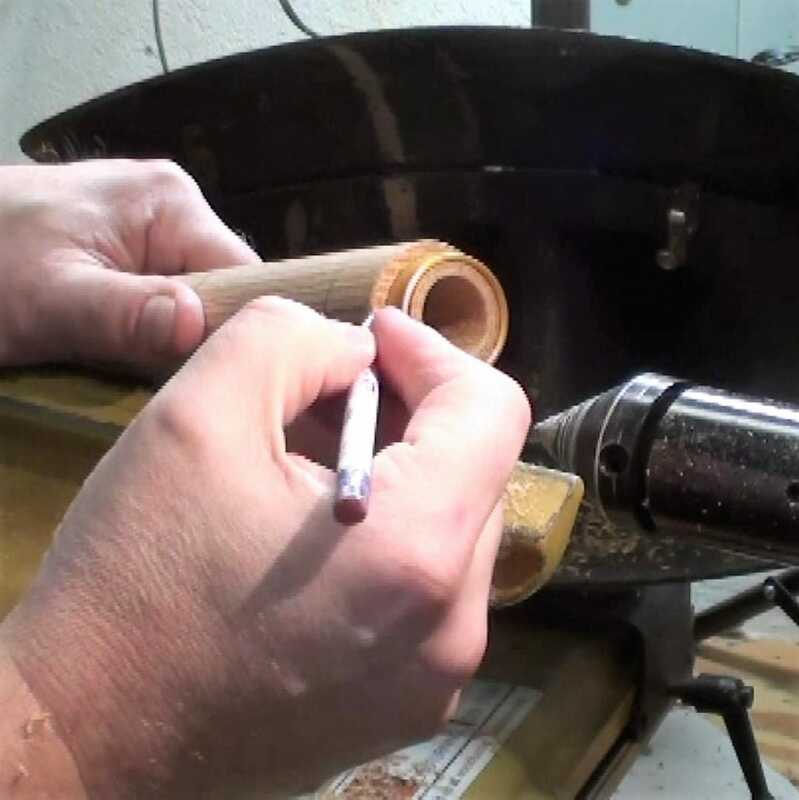 Turning the bead end to the ferrule mark made in the previous step. 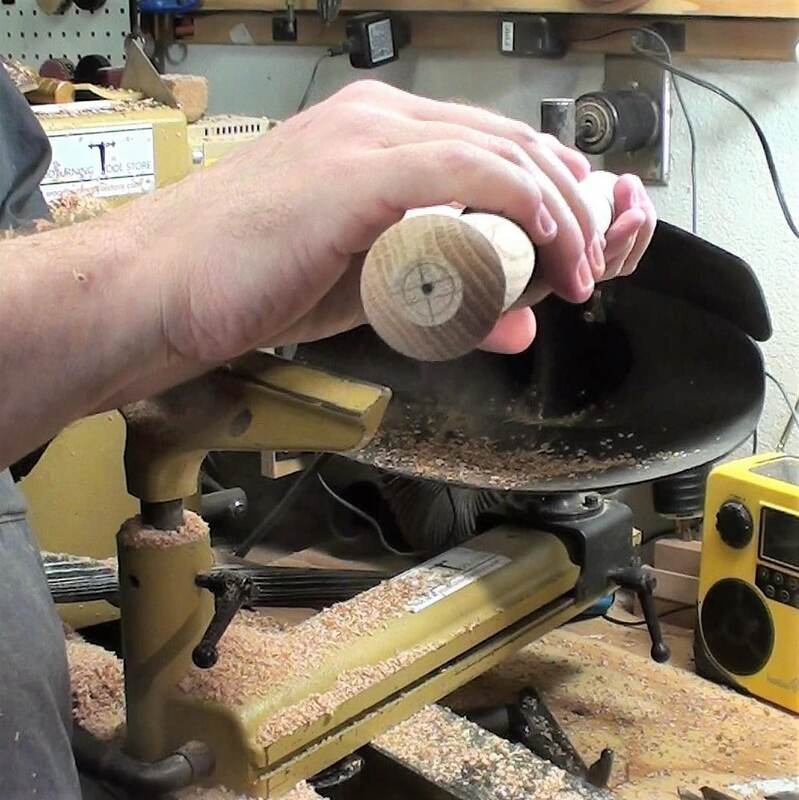 And I finish shaping the rest of the woodturning tool handle. 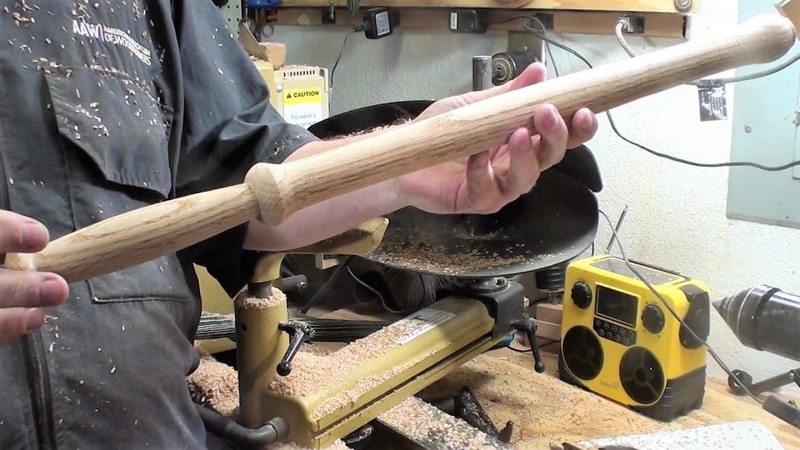 Here is the completed shaped woodturning tool handle. 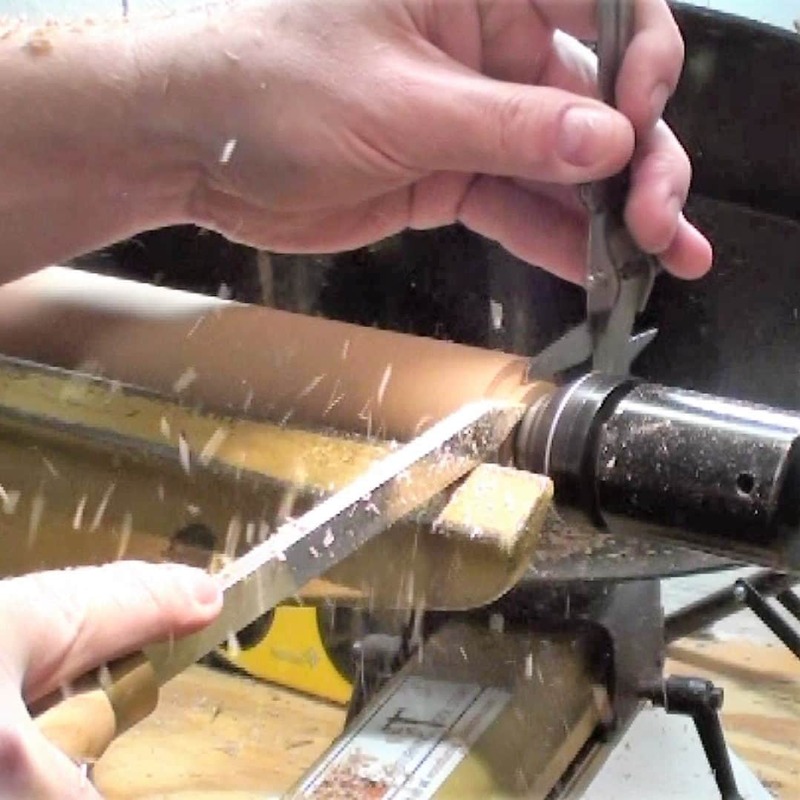 It is easy to remove and remount the handle blank on the lathe using the cup drive center at the headstock and the cone live center at the tailstock. Here you can see the mark left by the cup drive center which has a small center point. 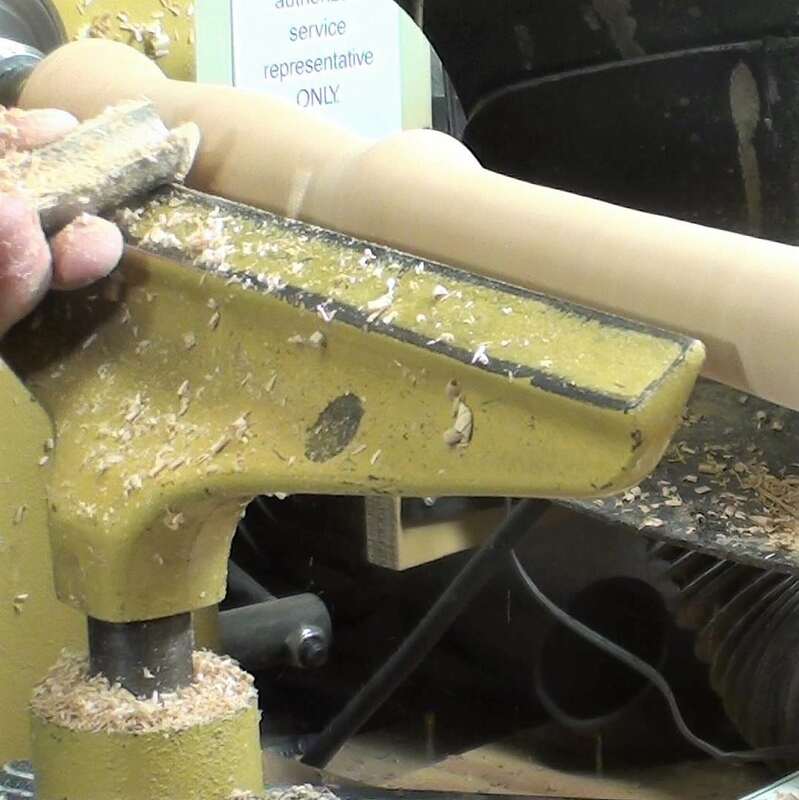 I will leave this on the finished woodturning tool handle–that way if I ever need to remount it on the lathe, I can. 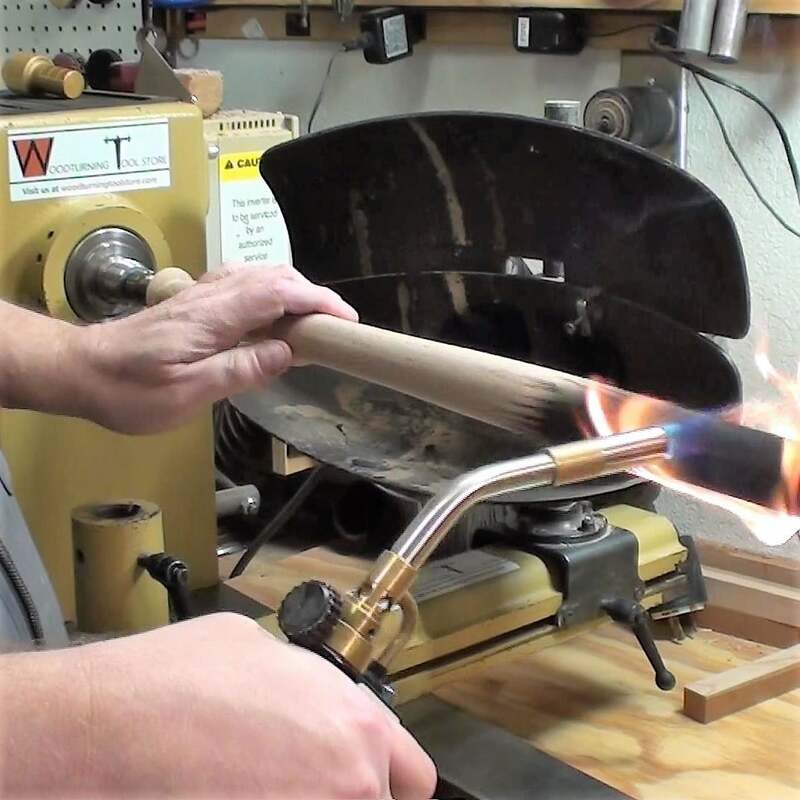 Since the red oak is an open grain wood, I thought I would decorate the woodturning tool handle with burning and cream fillers a la Jimmy Clewes style. Here I am using a torch to char the wood. Before I started I cleaned up all the shavings in, around, and under the lathe. Please be safe. Be sure to let the wood cool to the touch before proceeding. 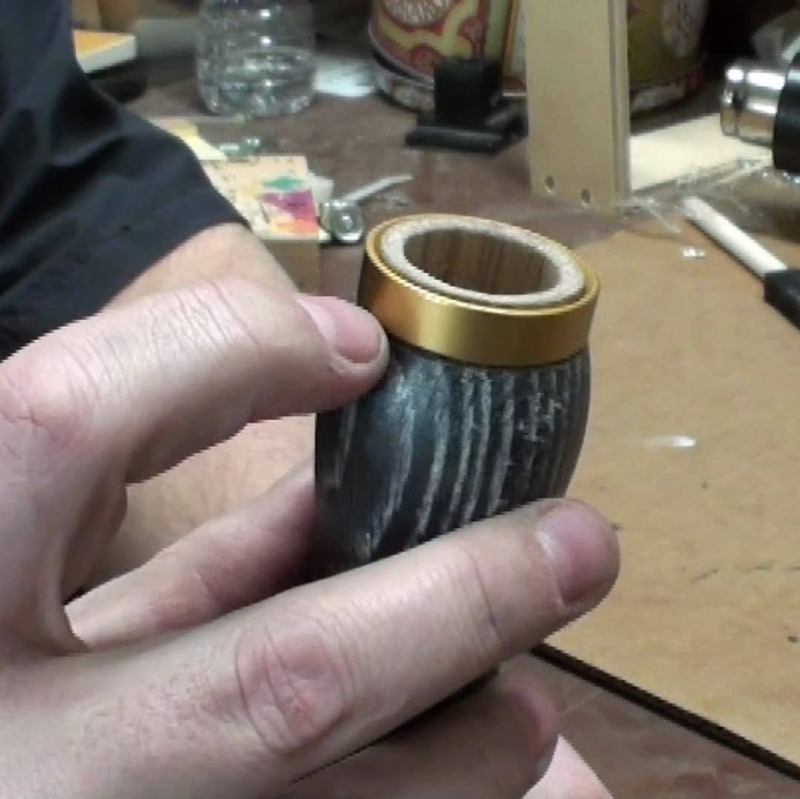 Using a small brass brush to brush with the grain to clean the soot off and out of the grain. I do not use the dust collector as I do not want any hot embers being sucked into the dust bins. Again, please be safe. 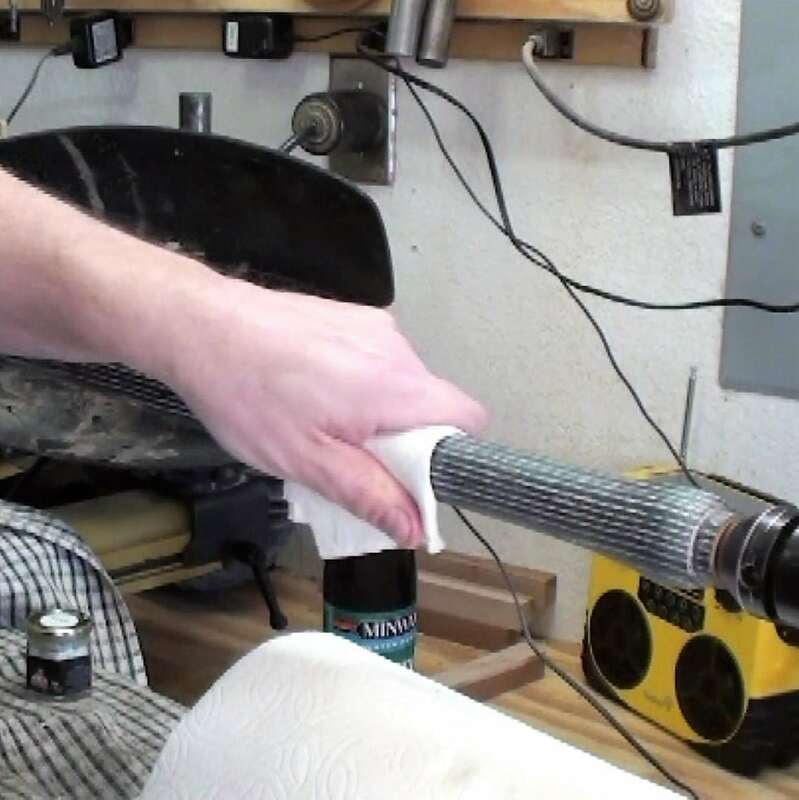 I used a small shop vacuum to clean up all the soot from the turning and all around. The piece needs a seal coat of finish. In this case I used Minwax spray Polycrylic. There are many suitable substitutes but a spray works best. Next, to highlight the open grain, I use Jimmy Clewes Metallic Cream Fillers –Pearl White in this case. Apply the cream filler liberally, wiping in circular motions to be sure to fill the grain. Now I wipe off the excess. Use a clean paper towel often so that you are not just spreading the excess filler around but are actually removing the excess filler. I went through several sheets of paper towel. 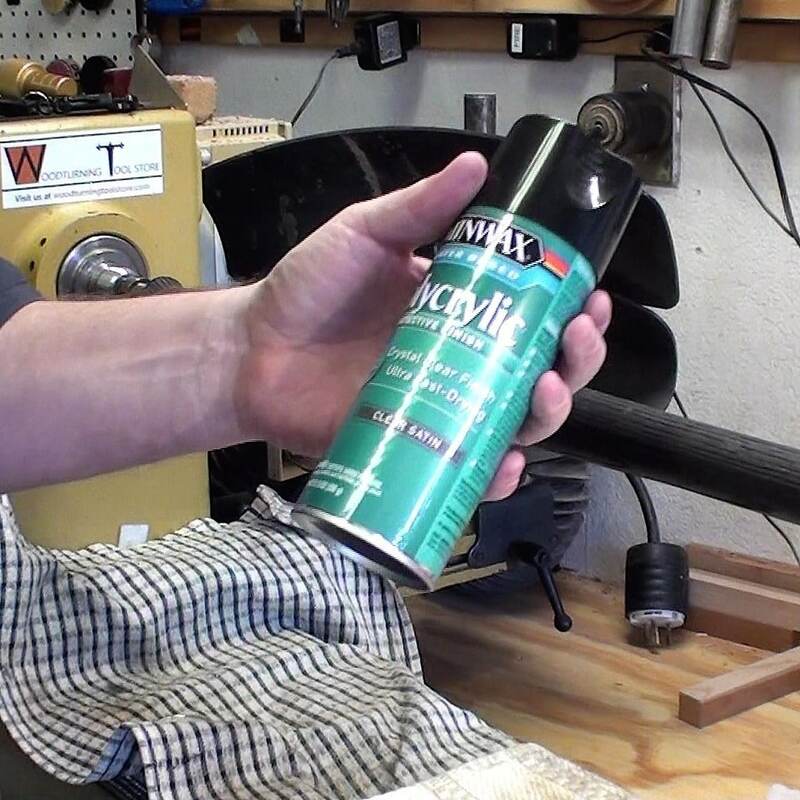 To get a good fit for the Jimmy Clewes Quick Release handle adapter, I used my flex shaft tool with an abrasive buff. Just sand away until you get a nice easy but not sloppy fit. I used 5-minute epoxy to adhere the ferrule to the tenon. 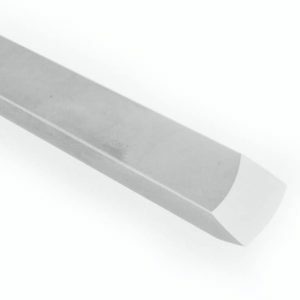 Smear a thin coat of the glue around the circumference of the tenon area and slide on the ferrule. Clean up any squeeze out and let this set up for about an hour and then come back and glue in the adapter. For best results, before inserting the Jimmy Clewes Quick Release unit using 2 part epoxy, make sure that the unit seats completely into the hole.You may need to hand sand or run a forstner bit to resize the hole. When the Jimmy Clewes Quick Release unit seats well, get a sharp nail or a V carving chisel, and score the inside of the hole. This is to allow a better grip for the glue and allows the air to escape when using the 2 part epoxy. If you don’t add these air escape channels then you risk the air pushing the glue and unit out of the hole after inserting the QR unit. 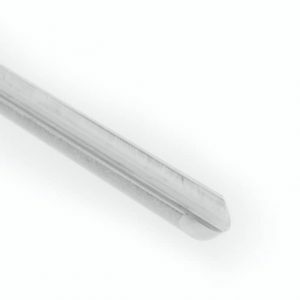 Jimmy Clewes Quick Release unit will also allow for a better key for the glue. 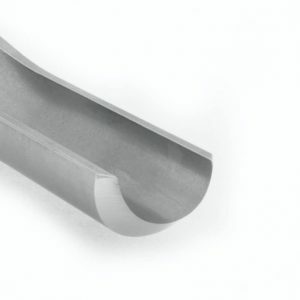 Place some plastic kitchen wrap or similar to the underside of the QR unit; this will help to ensure that the glue does not stick the rotating QR ring to base unit if too much glue is applied or the glue pushes out from the hole. Now be patient and wait for the glue to completely cure. Acetone will help with any mishaps or clean up. 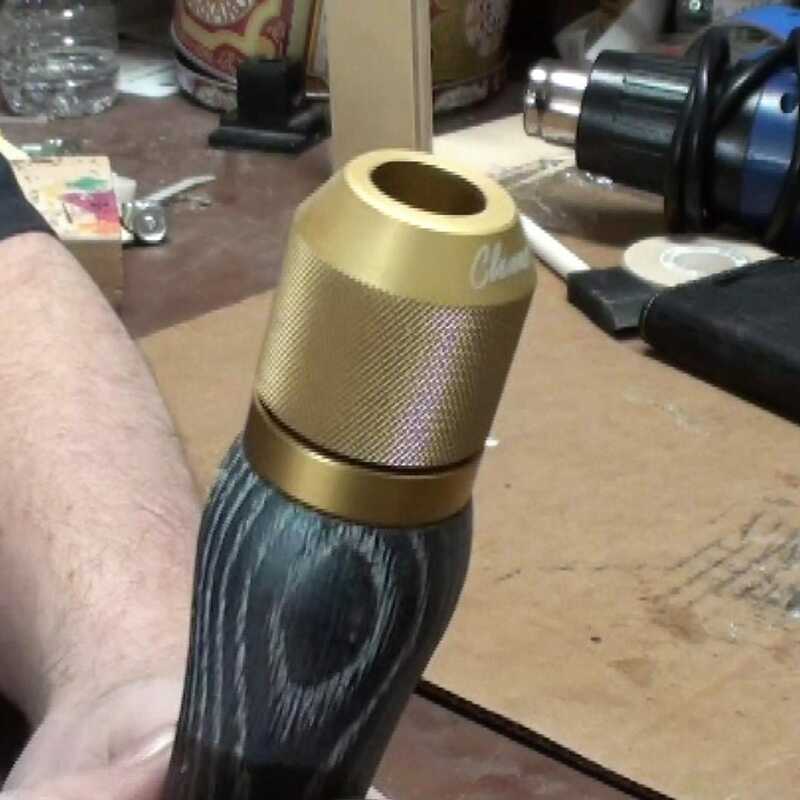 Here is the companion YouTube video for making a Woodturning Tool Handle Using a Jimmy Clewes Quick Release Adapter.